As First Financial’s Assistant Vice President of Business Development, one of my favorite functions in my role is business to business networking. Essentially I introduce First Financial Federal Credit Union, a not-for-profit organization – with local small businesses. As a community credit union, it is our goal to help local businesses build and expand. Partnering together allows us to use each other’s services, promote each other and help each other succeed. First Financial grows and our local businesses grow, it’s a win-win! We sat down with Tracey Mahady the owner of Clarity Salon in Brielle to talk briefly about her business. After 25 years in the industry, Tracey took a break to care for her father whose health was declining. She wasn’t sure she wanted to get back into a traditional salon setting, so her father suggested that she open her own small place. That small place she opened five years ago is not so small anymore! Clarity prides themselves on using the best high-end organic hair care products. These products function at a very high level and do not contain harmful chemical ingredients. Tracey’s favorite part of owning the business is that it truly is hers. She has cultivated a wonderful working environment for her five employees where everyone is treated fairly. The environment is fun, creative and simply beautiful. Customers are welcomed with personalized service and the finished product is excellent. Clarity Salon and First Financial FCU have worked together since the start of Tracey’s business venture. Tracey enjoys that we are very personal, reachable and there are no hiccups with her banking. The member service that we provide, is exactly what Clarity prides itself in providing to its customers – so the two business philosophies really go hand in hand. Obtaining a business line of credit for Clarity was a smooth process and really helped to kickstart the success of the business. Tracey would absolutely refer First Financial to friends, family and other business owners. • Advance from the line of credit as you need it! Call the Business Development Department at 732.312.1500, email business@firstffcu.com or stop by any branch location. Down at the Jersey Shore, the Wall Stadium Speedway is home to great racing and family fun for the surrounding communities and fans of all ages. From the time the Speedway first began racing in 1950, they have continued to provide a great experience for the fans who flock to the stadium. Since it opened, the Wall Speedway was created on 47 acres with the future and safety in mind, featuring banked turns and a one-third mile track. The track design was developed based on allowing racing car speeds to increase, but also providing a margin of safety. Over time, the Speedway was altered and updated a few times, adding more safety precautions such as a flat inner loop and a metal guard rail. Now it hosts many racing events throughout the year. One of the most recognized races held is the annual Turkey Derby, which takes place each Thanksgiving weekend. This year will be the 39thrunning of the popular event. As a family operated business, the Krause family works hard to make sure the needs of the fans are met. Stated Co-Owner Diane Krause, “Since our family began managing the Speedway in 2011 – we have really placed an emphasis on making sure our fans experience our family friendly, family fun atmosphere. We want them to have a great time, right in their own backyard!” And that they will, as Wall Stadium Speedway prides itself on its ability to provide family fun, offering entertainment not just for the diehard fans – but for kids too! In addition to the races, the Speedway also has a dunk tank, bounce house, face painting, and mini train rides. The Wall Stadium Speedway also has a new Kid’s Klub, where young racing fans can spend some time playing games, doing arts and crafts, and having all sorts of fun. The Speedway even has a personal party area for young fans to host birthday parties at the track! Over the years, the Wall Stadium Speedway has added new equipment, seating, a new sound system and lighting, among other amenities, and has renovated in order to keep the stadium up to date. They also have plans for a few more new additions in the future – so stay tuned! Wall Speedway currently races stock cars on Saturday nights in season. 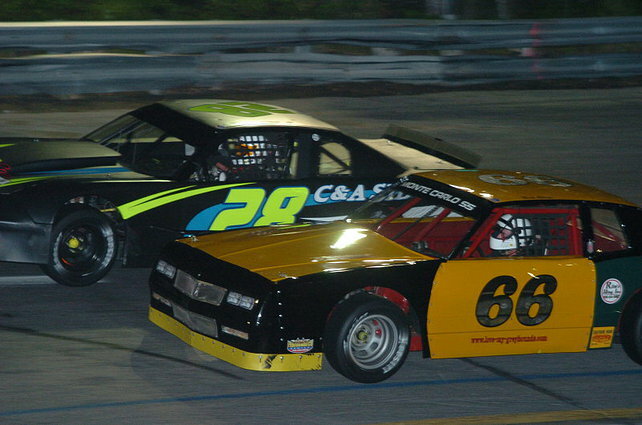 They have two Open Wheel Divisions – Modified and Sportsman Class, as well as Legends, and two Classic Divisions – Factory Stock and Street Stock. You can view the racing schedule at wallspeedwayracing.com. With the Corporate Office being right across the street from the Speedway, First Financial has partnered with the stadium by sponsoring a #88 Senior Champ Kart in the past. Caroline Nickerson (First Financial member since 1965), and mother of driver Roger Nickerson (built the Speedway’s Sunday Go Cart Series Program), approached the credit union’s Business Development team and mentioned her husband, Charles Nickerson was a former First Financial CEO and Speedway enthusiast. She hoped that Mr. Nickerson’s former two vested interests could be combined into developing a partnership. The credit union couldn’t have been happier to oblige and in addition to sponsoring the company branded Senior Champ Kart, also sponsored some additional event nights at the stadium. 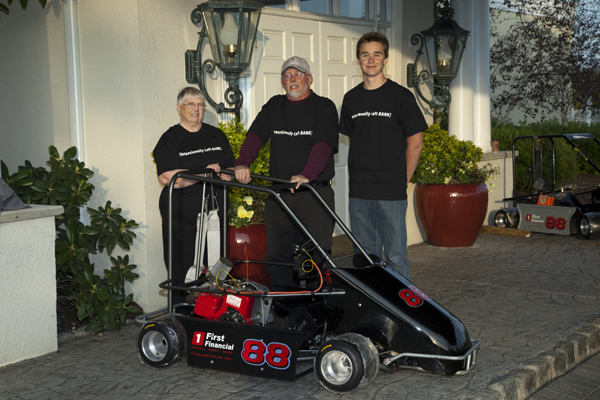 Pictured above: Roger Nickerson (center) with First Financial’s Senior Champ Kart, along with Caroline Nickerson (left) and Chris Gall (right). Please visit Wall Speedway’s website for more information and event schedules. To contact the Speedway, call 732-681-6400 or e-mail them at CKMotorSports@aol.com.